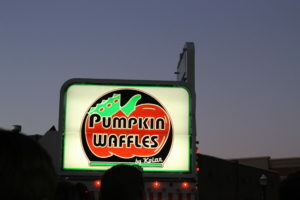 From hot dogs to waffles to coffee, each year the Circleville Pumpkin Show delivers a wide array of pumpkin sweets and treats amidst a festive and inviting small town atmosphere. 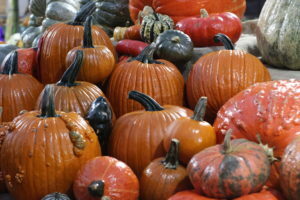 I’ve been a resident of central Ohio for my entire 20 years of life, and never once have I attended the Pumpkin Show, despite all the hype I’ve been hearing about since childhood. But I finally went for the 2018 show, and it was kind of a lot to handle. 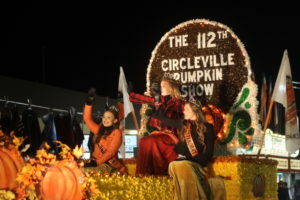 Each year for 112 years , the Circleville Pumpkin Show is on the third Wednesday through Sunday of October and features seven (yes, seven) parades in just four days. 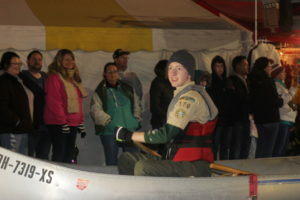 High school marching bands participate in the parade, as well as organizations such as Boy Scouts, gymnastic teams, and iconic Circleville staples like the Pumpkin Man, a resident who paints his face similar to a pumpkin and weaves through the crowds on roller skates. As a whole, the Pumpkin Show seemed like any other street fair on the surface. 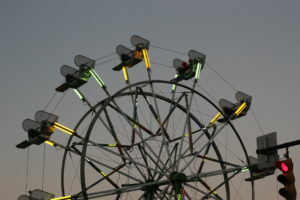 There were funnel cakes, corn dogs, onion rings, and fair fries with a whole lot of vinegar. There were small vendors selling jewelry and merchandise and the typical ring toss games where you can win cheap prizes (and also the game in which you throw balls into fish bowls to win actual goldfish). But the deeper I delved into the depths of the streets of downtown Circleville, the more I realized that the Pumpkin Show was different. There were more vendors selling pumpkin products than I could even count: pumpkin coffee, pumpkin pie, pumpkin doughnuts, the whole nine yards. There was a tower made of pumpkins and tables adorned with various gourds. 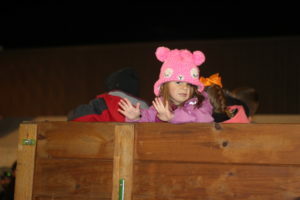 There was a display of the biggest pumpkins, the largest being a whopping 1,607 pound pumpkin. Jessica Litz, a Capital student, is a member of the family with the largest pumpkin. 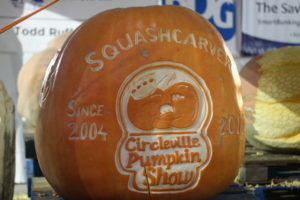 “Living in Circleville, [the] Pumpkin Show is something near to our family’s hearts. I grew up going every year and seeing the giant pumpkins,” she said. It was only the Litz family’s second year growing a pumpkin for the competition, and they won. 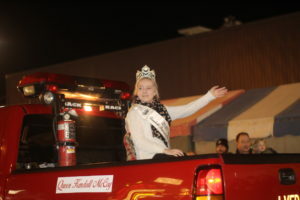 And when it came to the parades, Circleville residents were truly cutthroat. Families got to the show early Wednesday to set up a ridiculous amount of chairs (some of them weren’t even occupied by people) and left them there for the duration of the festival so that they had good seats for the parade. 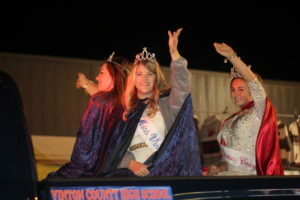 People cheer, clap, and scream for their loved ones in the parade and show their love as they march, ride, walk, or backflip their way down the street in front of the plethora of people in attendance for the parade. But boy, was it crowded. Even on Thursday night, it was difficult to move, let alone maintain any sense of personal space. I was constantly getting separated from my friends and the lines for every single food truck were insanely long. The parade of bands and youth organizations lasted for an hour and a half, and seemed to keep going on and on with no end in sight. As a whole, however, the Pumpkin Show was quite the experience. Although it was extremely cold and incredibly crowded, it was an experience that I’m glad I had. I witnessed the crazed crowds of Circleville in their natural habitat for an evening of fun while I stuffed my face with all things pumpkin.